This is not an offense that is easy to present on paper. 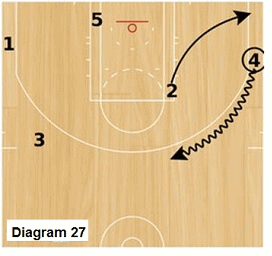 It is not as straight forward as a continuity offense. 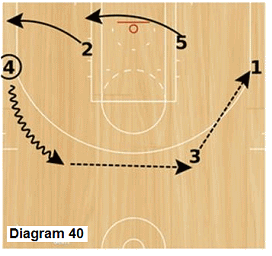 It is a motion offense, meaning it comes from the Passing Game (Dean Smith) family of offensive design. The beauty of the offense is how the simplicity of its rules and structure still provide for a complexity and variety of actions that not only provide for an effective attack but can accentuate the strengths of your team. There are four court areas to know... and there are four rules to follow. Those are easy to introduce... and implement. Then it is about helping them grow within the offense and making it work for them. I tell my players all the time, "I will teach you MY offense... then, you must make it yours." Through this breakdown, I will review the court positions and rules and then provide diagrams which represent a selection of the many actions which can take place. I apologize for it's length... but I want to make sure you see much of what this offense can offer. It is not only a fun offense to watch but also to teach as well. What makes this offense unique? This is a 4-out, 1-in open post offense, which is definitely a trend right now. However, too many open post offenses these days are either drive and kick, pick and roll or Princeton-style back-door offenses exclusively... 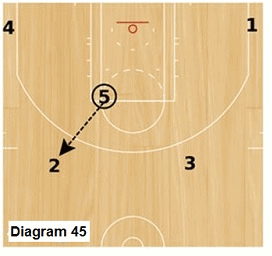 This offense offers a chance for all three styles to operate simultaneously and more... and it is easy to teach. 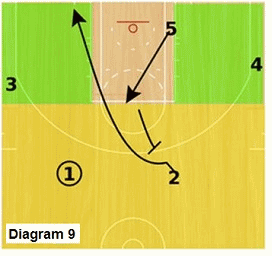 Passing Game, Dribble Motion, Circle Offense, Princeton, European Pick & Roll Game, NBA Hawks and Trail Blazers are the primary influences. Fluency (complex system is simple and easy to comprehend... allows for playing instinctively, effectively and creatively... learning the offense should be easy... what takes time is growing within the offense) then mastery. Know the 4 court areas and the 4 rules. There are three defined areas, which are to be occupied by four perimeter players (including the player with the ball). They are the 2 Wing areas and the Point. The ballside block is considered part of the Wing area but is only for temporary post-ups (2-3 seconds and then clear to corner). 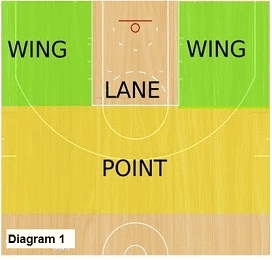 There must be at least one off-the-ball perimeter player occupying (or filling) each Wing and the Point area at all times within the flow of the offense to maintain floor balance. 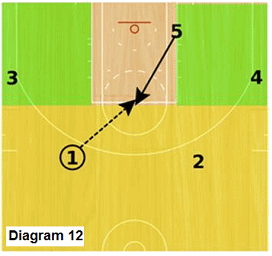 The post player can occupy the Lane or Point areas. 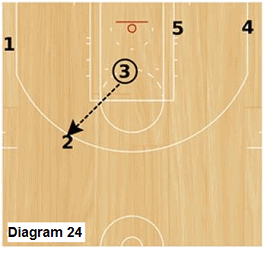 The only area in the Lane the post can not occupy is the ball-side block (except on specific play calls). Understanding the 4 Court Areas is very important. When a player with the ball (playmaker) enters their area, they must adjust by either moving to maintain appropriate spacing (15-18 feet if in the Point area) or moving to make a two man play (pick & roll, pick & pop, dribble hand-off, back door cut). This will be demonstrated later on. The playmaker is always the person with the ball on the perimeter. If a player is passed the ball, he then becomes the new playmaker. 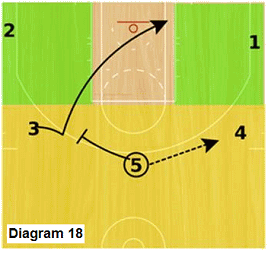 The Slice offense allows the playmaker to go to any area on the court with the ball to make a play. Though given tremendous freedom, we emphasize the word playmaker as someone who must make the EASY play or reset to the Point. They must be able to recognize the easy scoring opportunity (via shot or drive) or the easy passing opportunity (always make the easy pass), ESPECIALLY if that easy opportunity penetrates the defense. Not everyone is as effective as others with the ball in their hands but allowing for this flexibility enables you to take advantage of effective playmakers on your team. We borrow quite a bit from Dribble Motion, especially with this rule. In Dribble Motion, on the drive and kick the passer (playmaker) will fill the corner and then replace the man who has now received the pass (who is now the playmaker and drives into the Lane). The same applies in Slice when the playmaker passes the ball except it does not have to happen just off of a drive and kick. 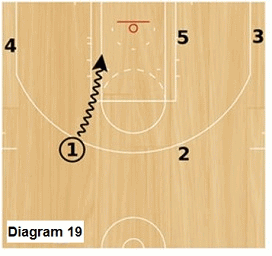 It can be simply a perimeter pass (or even a dribble handoff). The rule is simple... whenever a playmaker passes to a player in the Wing or Point area, he replaces the man in that area (the receiver now becomes the playmaker). The key is the word "replace". How do you replace? It all depends on the position of the passer and the receiver and the option they choose. 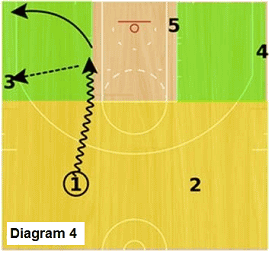 On a drive and kick, the passer can simply fill to the corner (Diagram 4). 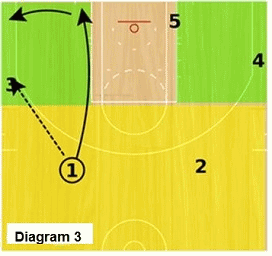 A simple swing pass from the Point area to the Wing, could result in the passer cutting to the basket and then filling the corner to replace (Diagram 3)... or the passer could follow his pass and run a pick & pop, the pop action is his replace action (this will be demonstrated later). 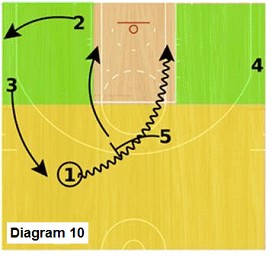 On a dribble hand-off, replacement action is easy and automatic. So is a pass from the playmaker who is in the Point area to another player in the Point area. That is simply a guard to guard pass and since they are in the same area, no replacement is necessary (though you could still execute a pick & pop if you want). 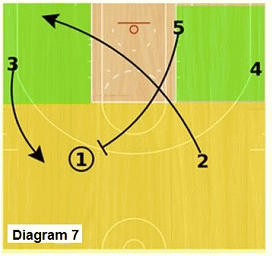 The off-the-ball player in the Point area has the option to backdoor cut. If he chooses to do so, he is to cut across the Lane to the opposite block/corner and then "bump" the off-the-ball player occupying the wing position, up to the Point area. This is our cut and bump rule. The key is knowing when to backdoor cut. We do not encourage it when we are getting consistent dribble penetration as we prefer are perimeter players be prepared to receive a pass. 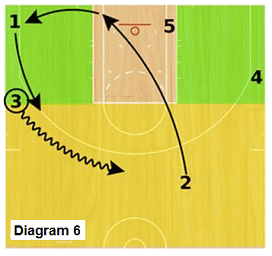 The best time to backdoor cut is when the playmaker is resetting in the Point area (pulling the ball back out, not penetrating)(Diagram 6) and/or dribbling towards you (Diagram 5). We encourage the post to be very active within the flow of the offense, especially when we are resetting in the Point area. 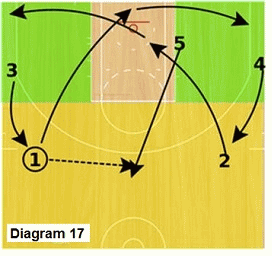 For example, the post has the option of running a "get" which is simply running a pick & roll with the playmaker... or backscreening the off-the-ball player in the Point area. 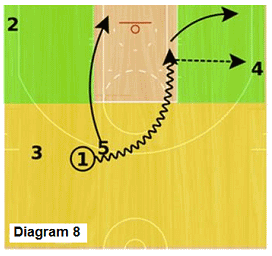 The pick & roll action is run just like a drive and kick, except for the additional roll option (Diagram 7 & 8). 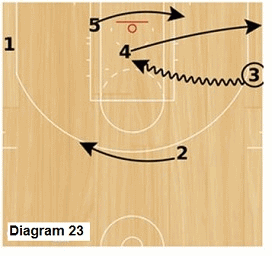 The backscreen is just like a backdoor cut except for post assistance with the pick (Diagram 9). 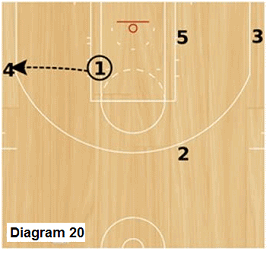 Because these actions do not deviate much from the original perimeter actions in Rules #2 and #3, they are very easy to introduce and implement. 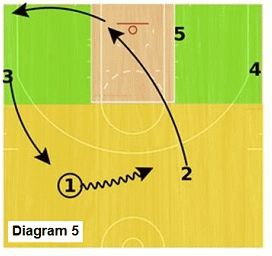 A common action after the backscreen is for 5 and 1 to run a pick and roll (Diagram 10). We refer to this as "Velcro" action (shown later). The post split, however, is a unique action. When the post flashes to the foul line or higher into the Point Area, we call it a "pinch" action. 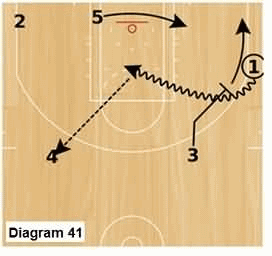 Because we run a 4-out, 1-in offense, the pinch action leaves the Lane wide open which provides the opportunity for a seal (Diagram 11) and pass over the top (should the defense over pursue). 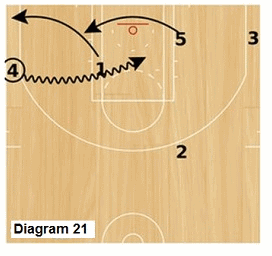 But if the post receives the pass on the pinch action (Diagram 12), the post split takes place immediately. The actions described next are if the post pinches to the foul line, though similar actions can take place if he extends high in to the Point area (this decision is made by the post). This is especially effective if you have a "stretch" post who can extend the defense. 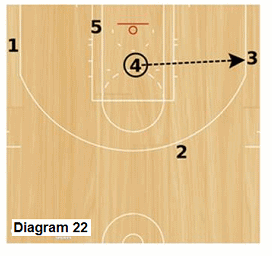 The post split action calls for both players in the Point area to cut and fill the opposite corners. The passer is the first cutter and has the option to cut behind the post (Diagram 13) or cut in front to receive a handoff or initiate a scissors action with the second cutter(Diagram 14). The second cutter is encouraged to misdirect before cutting, allowing for time for the first cutter to make a move. The two Wing players are to move up into the Point area once the cuts begin. 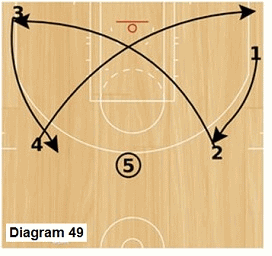 Essentially, in the post split action, the Point players replace the Wings and vice-versa. 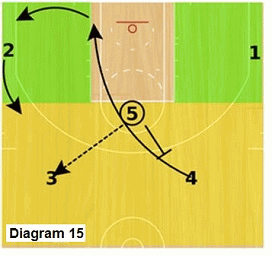 If the post chooses not to pass to the cutters and instead kicks it out the Wings entering the Point, he can then set a backscreen and/or run a pick & roll (Velcro) and we reenter the flow of the offense (Diagram 15 & 16). If the post elects to pinch to the Point area (high post), the same cutting action takes place (Diagram 17). 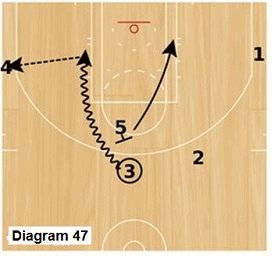 After passing, the post can execute a classic Princeton play which is a screen away with the perimeter player cutting backdoor (Diagram 18) and then pick and roll. This is our simple pass and replace rule. It continues to the other side. 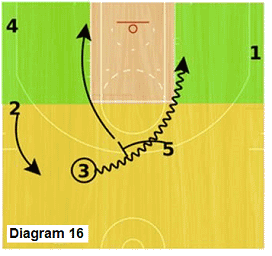 The post always slides over to the weakside on the drive creating an open post (like Dribble Motion). The biggest difference between our drive and kick action and Dribble Motion is that we don't slide 2 behind 4 on his drive. 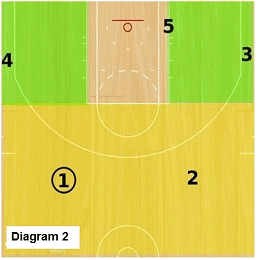 We want TWO passing options for our playmaker and so 2 and 3 both spot up behind the 3-point line (Diagram 21 & 22). 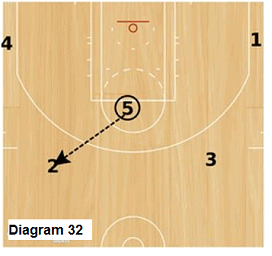 3 is now the playmaker... Watch how 2 adjusts his spacing to provide a target for 3 on the drive and kick (Diagram 23 & 24). 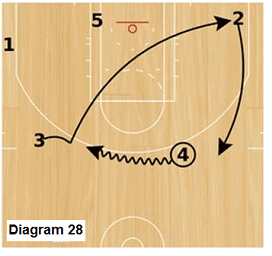 4 reverses direction and 2 cuts backdoor, bump and cut, 5 pinches (Diagram 29 & 30). 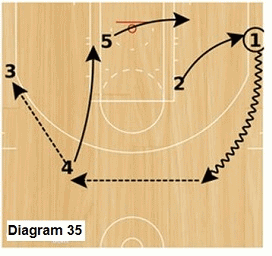 4 passes to 5 and we execute the post split and then 5 passes to 2 (Diagram 31 & 32). 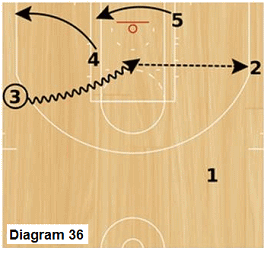 5 backscreens for 3 and then runs pick and roll (Velcro action)... (Diagram 33 & 34). 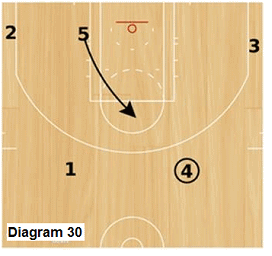 1 dribbles out and resets, passes to 4 who swings it to 3. 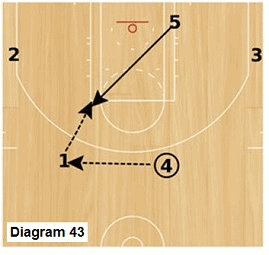 4 cuts to the basket and has the option to post and then clears to the corner... pass and replace. 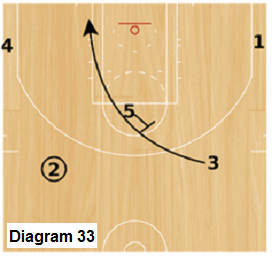 3 drives and kicks to 2 (Diagram 35 & 36). 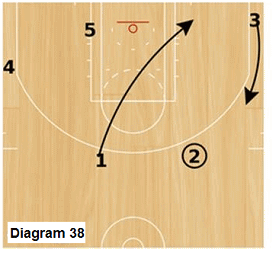 2 dribbles out to reset... 1 cuts backdoor and executes and cut and bump with 3 (Diagram 37 & 38). 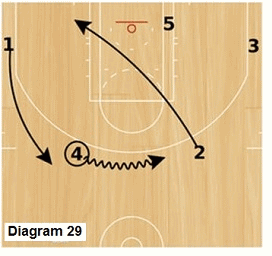 5 pinches and executes a pick and roll with 2 (get). 2 kicks it to 4 for a pass and replace. 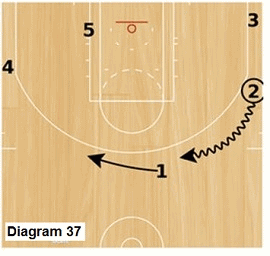 4 dribbles up and resets... swings the ball to 3. Remember, both 4 and 3 are both in the Point area and so there is no need for 4 to replace 3. 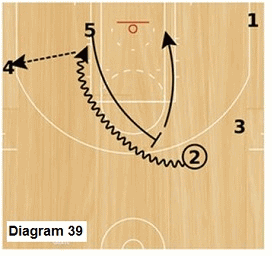 3 passes to 1 (Diagram 39 & 40). 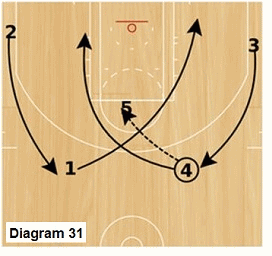 3 follows his pass and executes and pick and pop with 1... pass and replace. 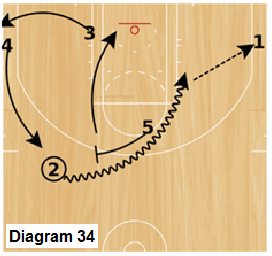 1 drives and kicks to 4... pass and replace. 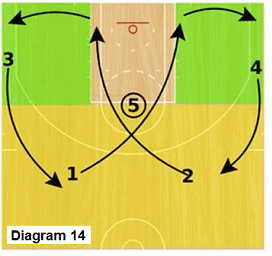 4 dribbles and resets (Diagram 41 & 42). This is a unique post split. 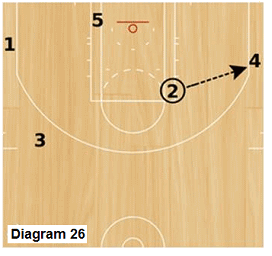 The pinch action by 5 is at the elbow, not the middle of the free throw line. 4 passes to 1 who then passes to 5. 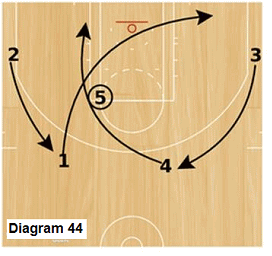 1 cuts backdoor and then four comes off to attempt a handoff from 5... post split action (Diagram 43 & 44). 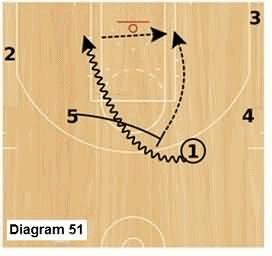 Here is another unique play. 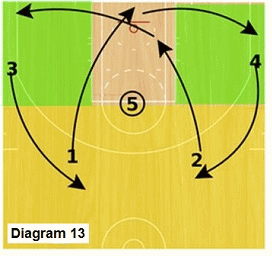 5 passes to 2… 2 then executes and dribble handoff with 3. 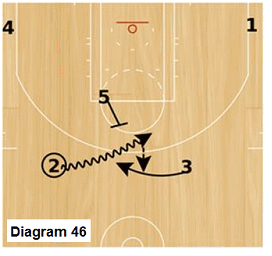 5 steps out to screen 3 (Diagram 45 & 46)... There are endless options to execute off of a pinch action and it is fun to let the players figure what works best for them. 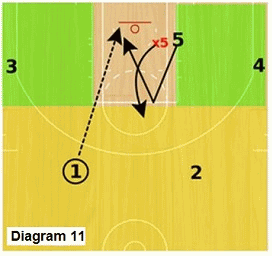 3 kicks to 4 and executes a pass and replace... 5 rolls to the basket. 4 dribbles out and resets. 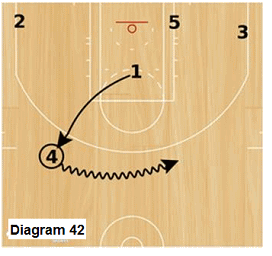 5 then pinches again but moves into the Point Area (high post) to receive the pass from 4 (Diagram 47 & 48). 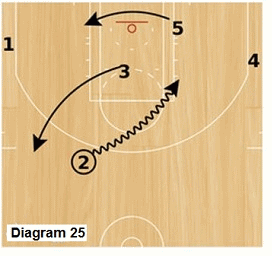 Post split action is executed... 5 then passes to 1 and then executes a Princeton backdoor play with 3. 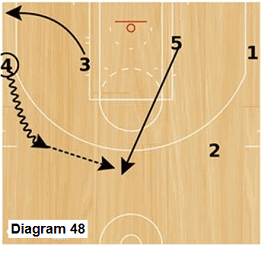 He then executes a pick and roll with 1 for the finish (Diagrams 49, 50 & 51). 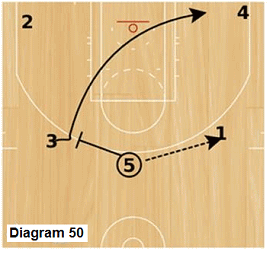 Executing the post split action in the Point area is a great option for 5 men who are "stretch" players with range... or exceptional perimeter skills. These are the basics of the man offense... Once your players pick up the Four Court Areas and the Four Rules (which does not take long), the offense becomes a lot of fun to watch. Even though there are many options for the players to execute, the rules of the offense always provide floor balance and answers... answers to all scenarios…and perfect symmetry.